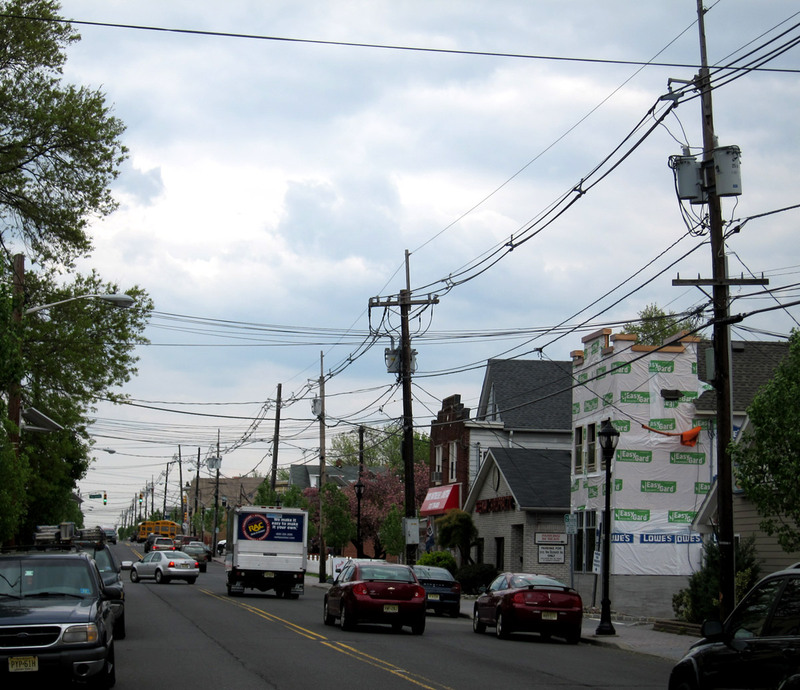 I had to laugh the other day as I read the front page article in The New York Times* on how the solar panels now attached to New Jersey’s electric poles were such an eye sore. MIREYA NAVARRO writes in the first paragraph of the piece “All they knew was one moment they had a pastoral view of a soccer field and the woods from their 1920s colonial-style house; the next all they could see were three solar panels.”. When I first looked at the photo by Juan Arredondo attached to the piece, all I saw was the ugly phone poles and wires (what ‘pastoral view’?). So, what I asked myself was: what is more of an eyesore, the rectangular solar panels or the ugly electric poles and wires? These horrible electric poles and wires have become so ubiquitous everywhere that no one sees them anymore. They have become visually erased from our retinas due to their unsightly ever-presence. 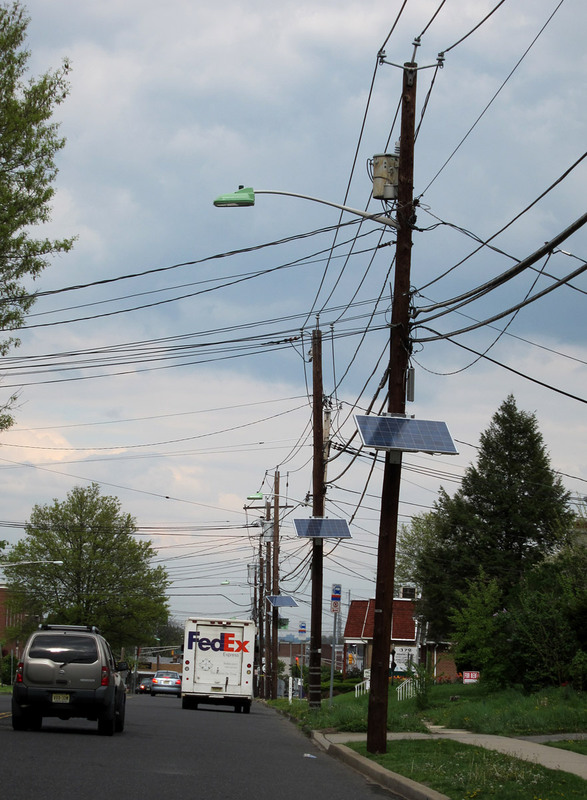 The only reason the residents of Fairlawn think the solar panels are ugly is because their attention is now directed to the ugly electric poles they are attached to and never before saw. 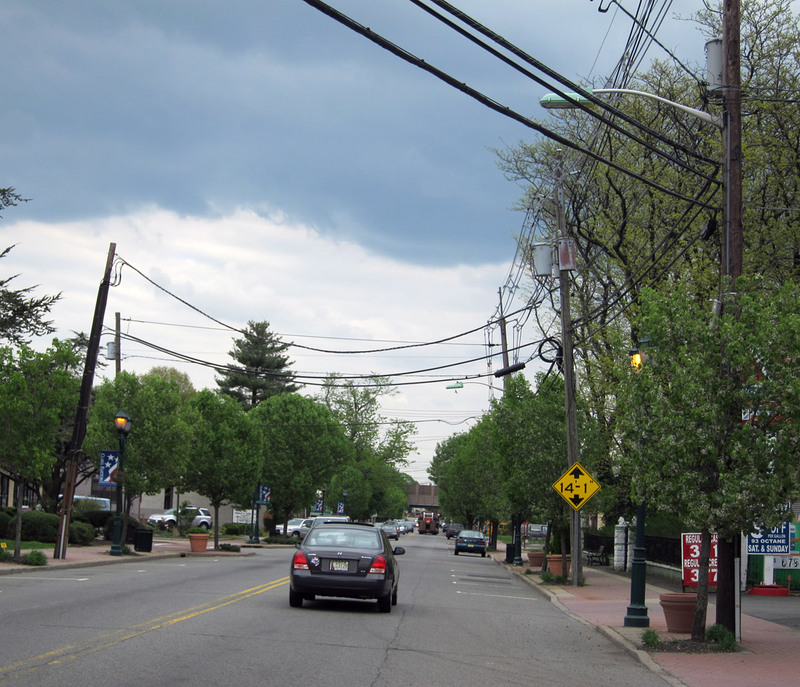 A good exercise to correct your retinas is to drive around your neighborhood and look for the electric wires and poles. Caution: You will see your quaint, twee town completely differently from now on. (This of course unless you live in a town where they’ve decided to bury the unsightly wires). Yesterday, I drove around and photographed some of the eye-sore horrors around my town of Woodbridge, NJ. You don’t have to look far, just up, and you can see the horrors and atrocities of your local townships’ utilities. Tree-abortions are a common disgusting side effect, as your townships’ laymen wield their chainsaws like Jason in that Halloween movie. Chopping into your trees like a spastic monster trying to buffer the zone around the utility poles. 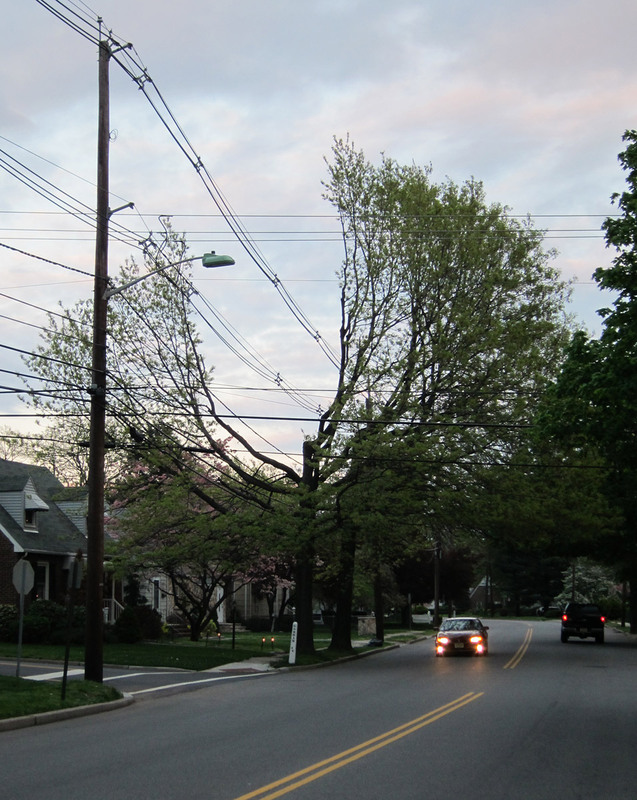 The worse tree atrocities are committed by Woodbridge Township trying to keep the tree branches away from the electric wires. This seems like a supreme waist of time. If a tree is going to fall, do we know which way? To do a hack-job on trees as Woodbridge does is ridiculous. 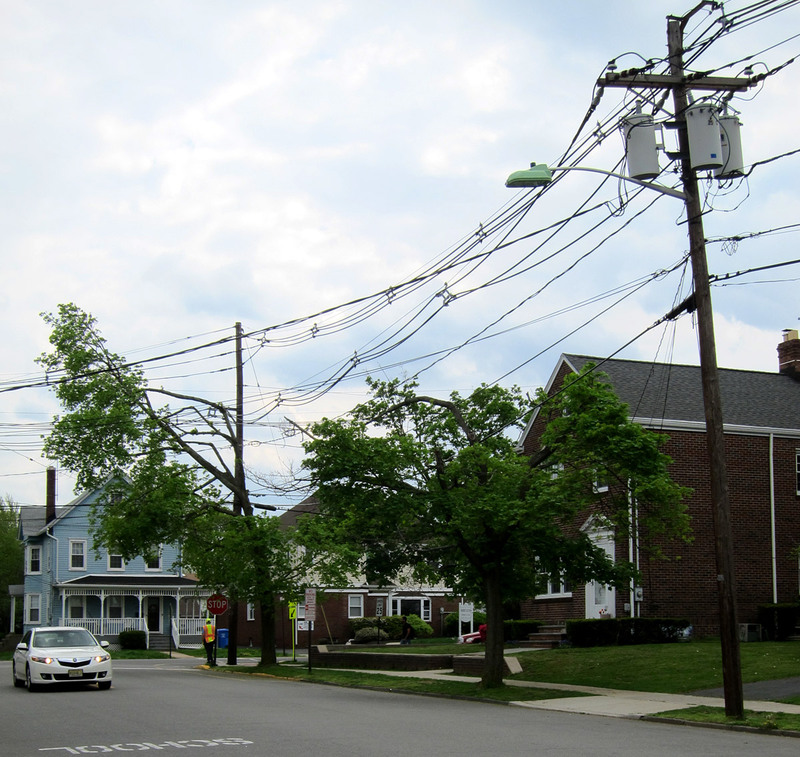 If you take a good look at the rectangular solar panels attached to the electric lines and poles, which truly is uglier? One thing that I don’t understand about these solar panels on the phone poles is that the utility that places them, puts them up so haphazardly. It appears that they have no strategy and no idea of how a solar panel works. Many of these panels probably only get 30% of their potential. Many are just blocked in shade by neighboring trees. California or at least some parts of Southern California, like Orange county have policies where you have to bury the electric lines. There have been studies where they’ve found crime to diminish in towns with buried electric wires. The biggest visual and financial blunder that these local townships have been doing to beautify, is to dig up their old concrete sidewalks and put in new beautiful brick-paver sidewalks and these little twee gas lamps. During this process of digging up the streets, which has to cost millions of dollars, they do not bury the electric and phone lines at the same time. I’m not sure of the reason. I’m sure that these administrators do not foresee that the effect will just create more visual havoc. With the phone polls, with the existing street lamps, plus the new twee gas-like street lamps, plus the electric wires and whatnot? There is so much visually going on that it makes the Xanadu Mall look like a Zen mat. I have a feeling that either the budget won’t allow all of the costs of burying all of the electric lines or they are not allowed by the utilities to do it and these administrators just say screw it, let’s do it anyway. Or maybe these people don’t see the electric poles either. To them, the end result looks marvelous. What is uglier in this photo, the three solar panels or the phone poles? I get my haircut in the Clara Barton section of Edison where they had this ‘beautifying’ project. Everyone in the barber shop was thrilled. When I mentioned how ridiculous it was that Edison was spending so much money digging up the side walks to put in the new paver-brick sidewalk and gas-like lamps and not burying the electric lines and that it still looked atrocious they were incredulous. I am sure that no one actually saw the electric lines and poles, they were erased from their daily experience. Unfortunately I am cursed. I’ve always seen these electric lines within a landscape. It may be my artist background that teaches to see everything. I am lucky to be a painter, if I don’t want to paint like Rackstraw Downes and paint in every urban detail, I can easily ignore the poles and wires. A photographer would definitely have a time of it in Photoshop. Plus the idea of: Is there a way to paint an electric line to make it beautiful? Or should I just ignore them and never paint them in? Depending on whether it’s my personal art or commission. Does a client want to see them in a portrait of their property? Somehow I doubt it. Maybe one day, there will be no need for this anyway. We have cell phones now so there is really no need for telephone lines. Maybe someday each home will be individually solar powered, creating enough hydrogen to power our cars, homes, TVs, etc. The landscape will maybe in the future look less 19th century. Maybe every home will have some kind of fusion generator that we can just throw our trash into for power. Will we always be connected like puppets to our utilities, our ISPs and our Cable Companies?